Davy Vain and the band named for him have been up against it from the beginning. Coming out the Bay Area in 1986 and doing glam/sleaze metal, when thrash was the current export, was challenging enough. Yet Vain released No Respect in 1989, an album still respected as one of the best of the genre. But the past is still present as Vain is battling on and against trends. Significantly, however, Davy Vain is still considered a fine vocalist and a gifted songwriter. Davy and company return from six recording hiatus to deliver Enough Rope, their sixth studio album. Above, Davy Vain: Nice wallpaper ... did they give him enough rope? Enough Rope is representative of expectations and the quality we expect from (Davy) Vain, even if the results are sometimes uneven. For example early on, even with the big beat, Greener seems muffled and lo-fi; and, Hot Stage Lights an intense deep hard rock groove only to be diminished by an overly repetitive conclusion. Conversely, Triple X, a rowdy rocker, and Stray Kitten, a melodic and catchy twist, sizzle with fabulous energy. Yet this pattern doesn't have to continue as the rest of the album breeds both consistency and interest. Cindy is a well developed melodic rocker. The ballad Treasure Girl offers some groovy guitar in an near AOR wrapper. it's probably the best, and most surprising, song on the album. Yet, Vain, if anything, is exactly that surprising but also constant. Songs like Worship You, Solid Gold, and the title cut are simple lessons in the glam/sleaze side of melodic hard rock. These tunes flame with groove, guts, glory all wrapped in whiskey fueled adrenaline. Ultimately, to this fan, my ears tune to Davy Vain's songwriting and vocal skill. I like him because he's equal parts the Sunset Strip and Seventies English glam. Frankly, he can sing, and sing rock. He's still that good. I'm hoping he (and the band) sound this good live. 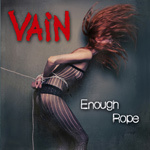 Vain's Enough Rope offers a surprising and entertaining platter of melodic hard rock swimming in the pool of classic Eighties sleaze/glam rock. Always the underdogs for sure, but Vain delivers with impressive results. Very recommended. 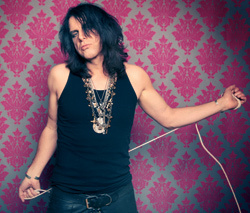 Vain's Enough Rope offers a surprising and entertaining platter of melodic hard rock swimming in the pool of classic Eighties sleaze/glam rock. Always the underdogs for sure, but Vain delivers with impressive results.